Goaltending will be key in the shortened season as I see a lot of coaches riding their #1 netminder for the opening 15 games - and by then you'll have a good indication of who can make the playoffs. As a result - the top 5 teams should rise to the top and the likes of the Lighting, Capitals and Panthers need a clear #1 to emerge to nail down those last 3 spots. Miller is good enough to get the Sabres in ahead of any of those 3 teams (I've now swapped the Panthers and Sabres after writing that), while the Jets will go as far as Pavelec can carry them. The Devils and Senators fall out of contention for mine after being playoff teams, while the Canadiens and Islanders will do better than last season. That leaves the Leafs - who are toast if they don't upgrade in net. I like a couple of first round upsets in the Caps and Bolts accounting for the Bruins and Hurricanes, but the Pens (Miller might steal a game or two in the first round) and Rangers (in a great first round series v the Flyers) are my picks to advance past them in the next round. Lundqvist v Fleury... If King Henrik stands on his head and Flower doesn't bloom - no amount of Crosby or Malkin would save the Pens. But here's hoping MAF does. Kings deserve to be favourites even if they waited til the last minute to go on their run... mind you that ended in a Stanley Cup - so hello #1 seed. 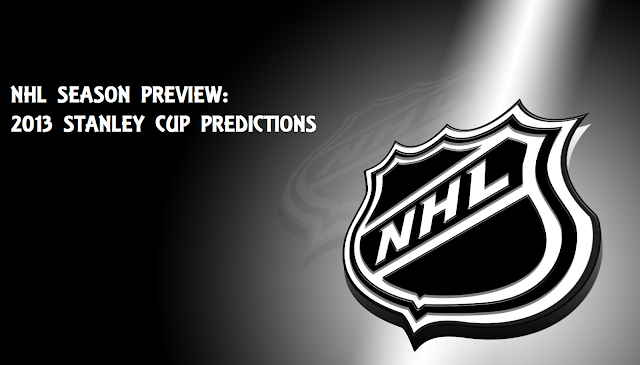 The Canucks will be good per normal and the Blackhawks look the best of the Central to grab the #3 seed. The Sharks should be better in a shorter season if Niemi remembers how to be a stud, and the Stars could be the big improvers with some veteran winners on board. The Predators and Blues take a step back this season but their goaltending should keep them in the playoffs, while the Red Wings are a concern with no Lidstrom holding that blueline together. Still they get into the 8th slot on reputation, with the Coyotes my only team to drop out of the playoffs from last year - Smith can't be that good again can he? The Wild need Backstrom back to his best in net - with or without Parise/Suter, while the Oilers are picked on potential in 11th. As for the Ducks - don't write them off like I have, while the Flames, Avalanche and Blue Jackets look like numbers making uppers... but see previous sentence - what do I know? No upsets in the Round 1, so I'm giving Marleau, Thornton, Boyle and Niemi one last chance to break the San Jose duck-egg when it comes to pushing through the playoffs. I just think they can get the Kings if Niemi plays out of his skin in the 2nd round. The Canucks get to another Conference Final, courtesy of a 7-game series against the Hawks. I've backed the Sharks to beat the Kings, so why not the Canucks? I just think this short season is made for Thornton-Marleau to make it a 1997 Draft-class playoff run to remember. The Pens have arguably the two best players in the game, so this isn't a reach. That said they had this entering last year's playoffs and got bounced in the opening round. They are that good however if Fleury plays like an elite goalie (he's done it before and they won the Cup because of it), because Malkin and Crosby are an irresistible combination. They can beat the Sharks in 4 games if Malkin/Crosby go nuts, but as I've mentioned - there are some quality veterans on the Sharks - so I expect them to give the Pens a run for their money in the Cup Final. Mind you - I only just changed my mind late in the editing process of this NHL Preview - I had the Pens v Kings again for much of the week. The Kings obviously as defending champs and three teams from the East. I think the Flyers could if Bryzgalov plays to the value of his contract and Giroux is Giroux, the Rangers are a beast if Nash and Gaborik score 70 goals between them and the Caps might just be a Cinderella story come playoff time if Alex the Great is just that. The Bruins, Canucks and Blackhawks have the pedigree to make a run, but I'm not 100% sold on their goaltending. If Lindback is a legit #1 - the Bolts can make a run with Stamkos, St.Louis and Lecavalier, the Hurricanes look a classic regular season team who can't score in the playoffs, while the Stars have a veteran unit who might steal a playoff round. The Blues, Red Wings and Predators... sorry boys had your chance last year. As for the Sabres - I only put them in the playoffs very late ahead of the Panthers - meaning I believe neither can win. Best 3 teams I don't have in the playoffs? Obviously the Panthers, then give me the Wild and Coyotes. Awards Note: Honestly, if the Pens are as good as I expect - flip a coin between Malkin and Sidney Crosby for all the major awards. Stamkos could sneak away with it though if he scores 40 goals in 48 game season and the Bolts make the playoffs. It's Bylsma or Kirk Muller for the Adams, while I really like Huberdeau's name so he gets the Calder like Landeskog last year. Go Cam Ward with almost 30 wins and a ridiculous save % for the Vezina in a battle of two with Jon Quick. Enjoy your NHL this season... thankfully there is one.